Parts of Speech Craftivity... for FREE!! 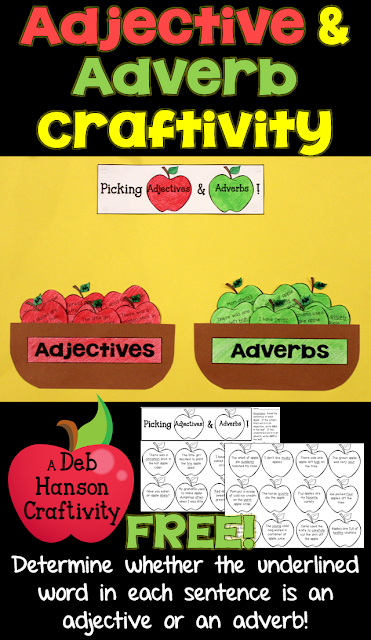 I am just writing a super-short blog post today to share my revised FREE Adjective & Adverb craftivity! In my experiences teaching upper elementary, students struggle with adjectives and adverbs... and understandably so. They do have similar functions. Students must have a solid understanding of nouns and verbs before they are able to reliably identify adjectives and adverbs. Most of the time, students do fairly well identifying adjectives and adverbs in isolation (for example, many kids understand that "beautiful" is an adjective), but once you ask them to identify the part of speech of a certain word in a sentence, it suddenly becomes much more difficult for them! And that's why I decided to create this FREE craftivity! It gave my students another opportunity to identify adjectives and adverbs in sentences, yet it wasn't a "boring, old worksheet". Plus, it makes a great fall wall display! If you think you can use it with your students this year, please feel free to click on the photo and download it! Deb, we must have been on the same wave length with apples this week. Love this activity! How cute this craftivity is! I LOVE it, but then I LOVE all of your products! THANKS so much for sharing this with us! You are always so generous. Thank you. I can't wait to try this in my classroom. This is going to be a great break from book work in grammar this year! Thank you!